In their downtime from farming and lumbering, the boys and young men would enjoy a game of baseball amongst themselves. Last week I found a picture with the caption on the back saying, “Well, I declare! 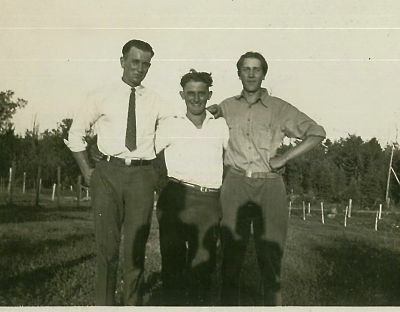 Part of Daggett’s first baseball team.” Oscar and “Biz” (Loren) Aderman and an unknown third man (standing in the middle) are shown in the picture. Oscar was the catcher until he got hit in the face with a ball and had trouble overcoming his skittishness after that. 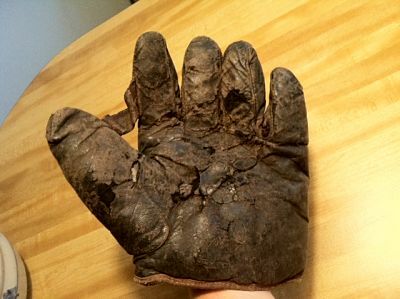 His baseball glove was quite small and poorly padded by today’s standards. 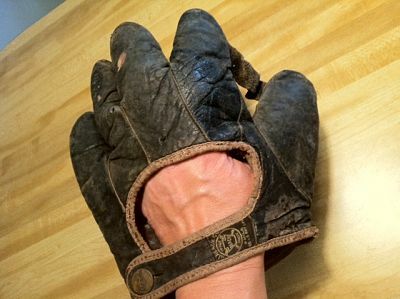 Oscar had large workman’s hands–the glove would have been a tight fit for him. Oscar’s son tells of playing catch with his Dad. Of course, he was sure his Dad was “out of it” and would not know a thing about baseball. He was surprised and humbled when every kind of ball he threw at his Dad was caught–his Dad was really good at baseball!